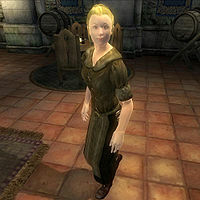 Marguerite Diel is a Breton adept with a deep, dark secret who resides at The All-Saints Inn in the Imperial City's Temple District. She appears after the Dagon Shrine quest along with Styrbjorn with orders to kill the player, but the two of them disappear after Light the Dragonfires. Marguerite wears a set of lower class clothing: a collared shirt, breeches and a pair of rough leather shoes. She also carries a small amount of gold. Marguerite knows the standard Mythic Dawn Bound Armor and Mace spell, as well as one summon spell, one shield spell, and one shock damage spell. The construction set includes a gravestone epitaph for Marguerite (in GraveScript02), although it is never used in game. The epitaph reads: Blessed Nine - Sweet Wife - Gift of Faith. Marguerite Diel / Passed F Fall 3 431 / 58 yrs. Esta página foi modificada pela última vez à(s) 17h21min de 23 de maio de 2013.